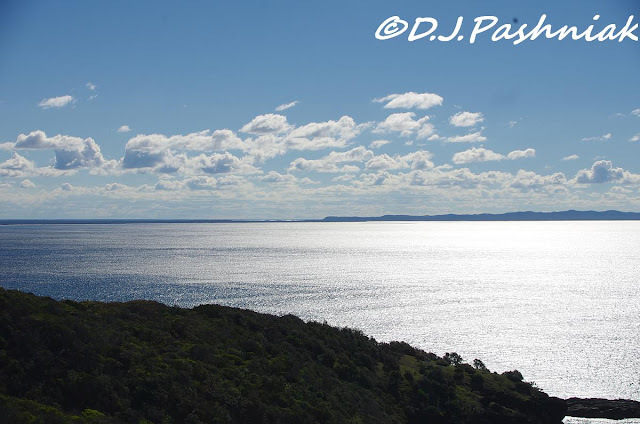 I have lived here for 10 years and during that time I have only seen Double Island Point from around Rainbow Beach. It is the most southerly point visible along a long line of beach which curves away to the south east. So although the other parts of the National Park that I visited with Sarah and Graham were interesting and beautiful, the high point of the day for me was to finally see Double Island Point close up. We reached it by traveling from the south along the beach. After so many miles of sandy beach this rocky headland is magnificent. This photo is looking south from the point. This photo is looking to the east along the southern edge of the point. With sunshine and a blue sky the sea is a mixture of blue/green colors. I am told that this area south of the point is a favorite place for surfers. There were two people surfing there that day and both appeared to be on longer boards. Of course, I was looking forward to going to the top of the Point and seeing the lighthouse up there. I had been warned that it was a steep climb - and it was! The track was well made - but the lighthouse is at an elevation of 96 Meters (314 feet). (And, unfortunately I am not as fit as I would like to be!) This is the view south from about half way up. 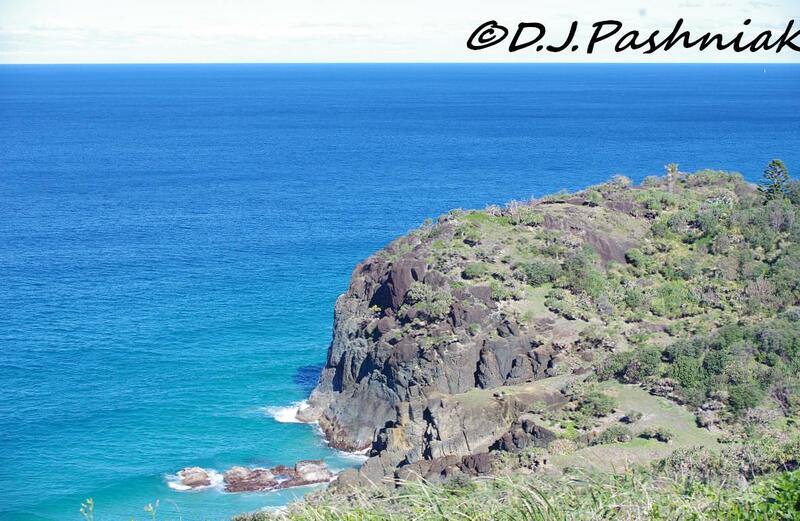 There are also views looking down the steep rocks to the sea below. Finally, I made it! The lighthouse was built in 1884, flashes every 7.5 seconds and has a range of 26 nautical miles. It was automated and demanned in 1992 and now runs on solar power. The view from up there is fantastic! This photo is looking northwards. Rainbow Beach is just beyond where the sand blow over the hills is visible. 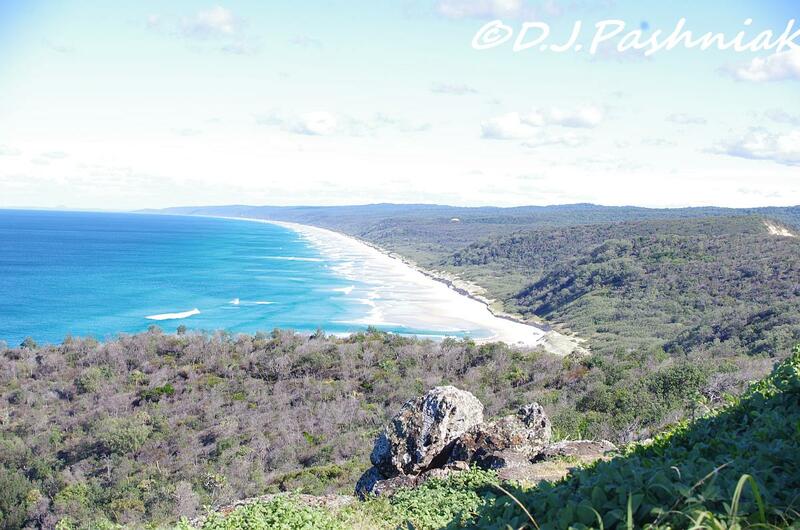 This photo looks right up towards Fraser Island which shows just where the very low land of the peninsular rises. 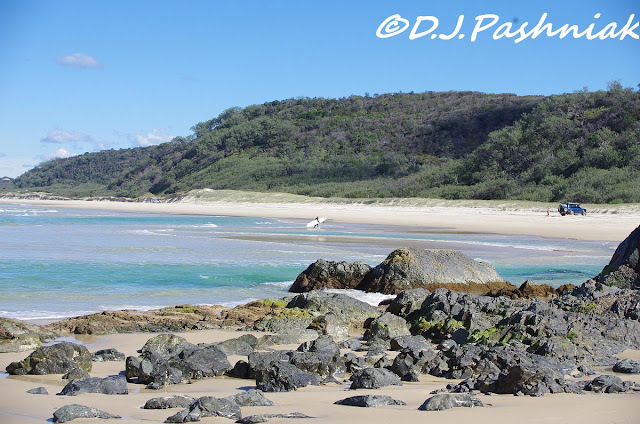 This is also where the channel is between the island and Inskip Point and if you enlarge the photo you can just see the bay waters as a silvery line behind the first line of land. Thanks again to Sarah and Graham for a truly wonderful day! Were there birds around the lighthouse and the Point? Of course! Did I get photos of them? No! I was too concerned about making it up and back under my own steam! 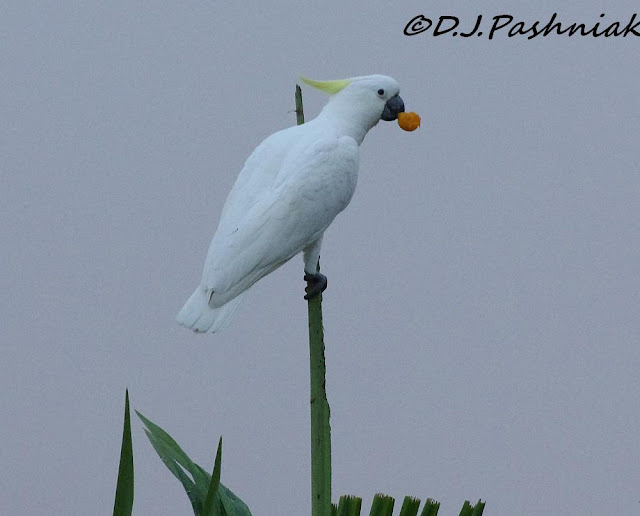 So for this week I am showing some Sulphur-crested Cockatoos. White Cockies fly over my house every morning. For the last few days some of them had been dropping down into my back yard. They had already eaten (or demolished!) the fruit on my Passionfruit vine so I wondered what they were getting at now. When I walked out to where I had a better view I saw them on the ground beside my little Kumquat tree. (This is a citrus tree with very small fruit that has a sweet rind and flesh.) I grabbed the camera and walked down there to chase the birds off and to get what photos I could manage in the half-light of early dawn. There were eight birds in total and each had a Kumquat! Needless to say there were not too many left for me! 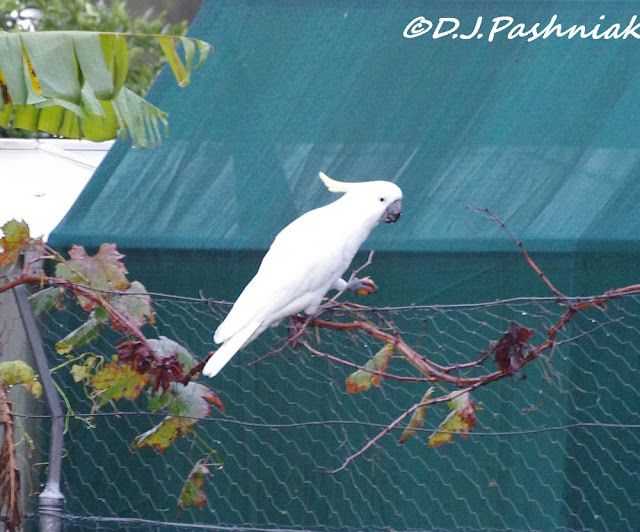 Some Cockies were up on the fence and one was swinging from the top frond of the palm tree. Feet hold food just as well as beaks! One extra bold bird stayed on the fence to make sure I really was chasing them all away. the cockatoos are amazing - especially that they are wild instead of caged in someone's den. beautiful blue waters and rocky cliffs in that area! That's really just a gorgeous headland and park -- and quite a walk to the pretty lighthouse! Stunning shots and an interesting post. What a beautiful coastal area to explore. 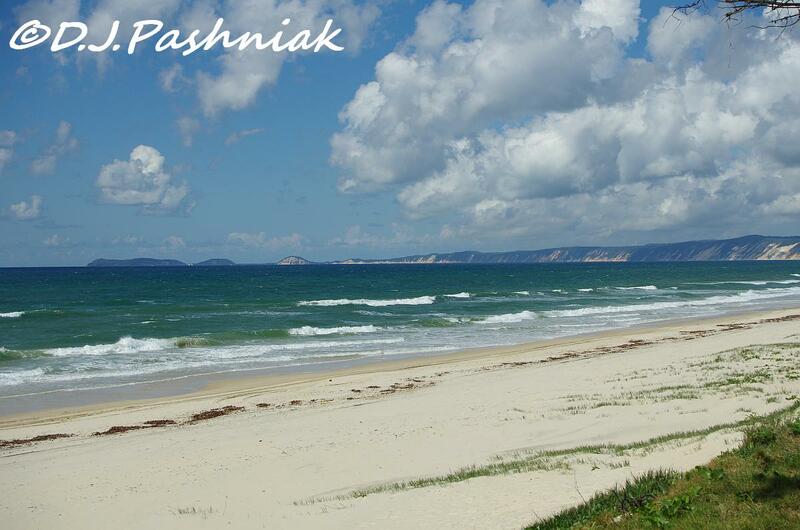 Fantastic beach!! Boom & Gary of the Vermilon River, Canada. Lovely shots of a Paradise! Such a beautiful place...and no people! 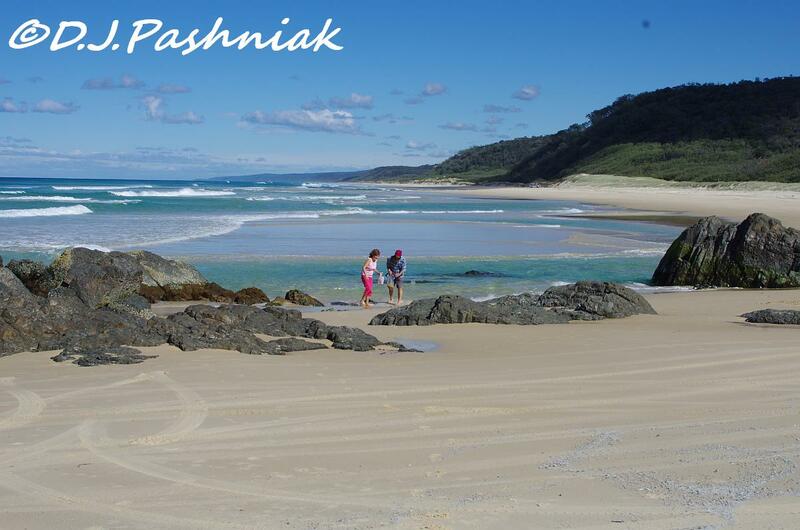 What an awesome beach and coastal area! Looks like paradise to me, too!! The cockatoos are delightful! Terrific captures for the day! Thanks for sharing your beautiful world!! What a beautiful beach! You've taken some stunning shots! The beach and the lighthouse are beautiful. Lovely views from your walk up to the lighthouse. It is cool you see these Cockatoos in your yard, I have only seen them in cages. Wonderful photos and post! I really like the light house the best. Beautiful spot glad you enjoyed the day. Wow! It doesn't get much more magnificent than that. SO gorgeous! I mean really, it's beautiful! I can only imagine how marvelous you feel when amongst this vast and endless sea. Have a wonderful week & blessings to you! What glorious shots of the beach! It looks wonderful! I'm glad you got to the beach and then up to the lighthouse to share your photos with us. Just beautiful. Great views - I love walking along a beach anytime of year - thanks for taking me there during my mid work week. And yes, sometimes Automatic works very well for me! Have a great week. Fantastic views from the lighthouse Mick. I'll bet your glad you made the hike up there, I would be. Wish we had (wild) cockatoos in our garden. Great serie of photos from the coastline! The beach must be a great place to be! Beautiful photos and an interesting place. Magnificent beach scenes! Love the variety of blue tones in the water! The white crested waves are particularly lovely in the first photo! Oh, those ocean pictures are stunning! I can almost smell the salt air. Sounds like quite a hike! Sorry you lost your Kumquats, but it had to be worth it for those captures. Beautiful photos, those cockatoos can be buggers. enjoyed the lovely beach/coastal photos and yes those cockatoos will take advantage every opportunity...shame to lose your passionfruits and cumquats; what can you do? Hi Mick. Thanks for setting me straight re my dumb Osprey / Brahminy Kite mis-identification – and in doing so, introducing me to this blog. Beautiful views! Handsome Cockatoo, even if it is thief! More beautiful landscape shots! I think I'd have a hard time concentrating on the wildlife. I'd be thrilled to see the Cockatoo's in my yard. I guess I'd let them take what they wanted. Yes, I rarely remember to change settings especially if I know if I don't just shoot I won't get anything. Happened just this week with some vultures. I had to lighten them to get one decent image. I captured the moment, just not well. Glad you made it up there, it was a marvelous view up there! Sometimes there is no time to think when you see something interesting out there! Just grab the camera and shoot! this is teh kind of shores that speakes the most to me. Love to visit such places. But rarely have the opportunity. What wonderful views of a marvelous place! I love the view and the cockatoos. Incredibly beautiful scenery!! I could spend hours, if not days in the very spot!!! Love the birds too. Next time, maybe you'll have extras for them? 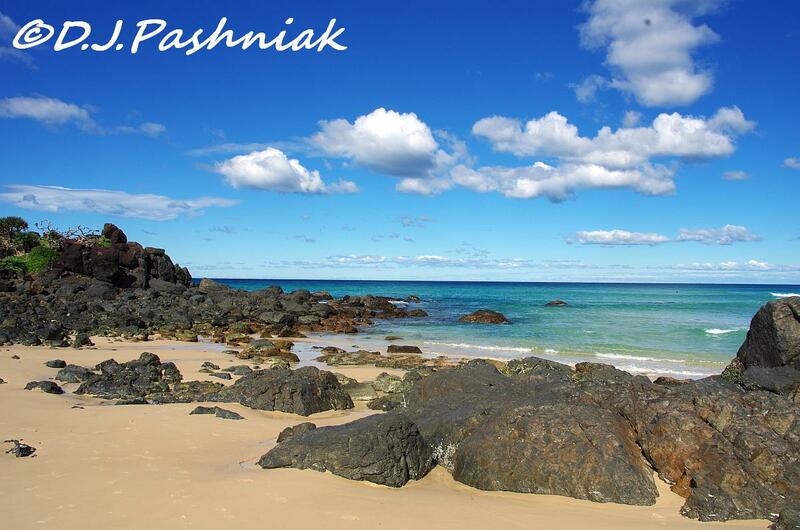 Beautiful and scenic beach. The birds have great beak. I'd love to be walking on that beach. But maybe not the lighthouse puffer trail. And those raiders! Kumquats kum and go I guess. What a beautiful place! I love those rocky shores. Oh, what a beautiful spot! It looks like a bit of a trek up to the lighthouse, though, but well worth it for the view. Wildlife in the garden is a problem for me, as well. It is a fight to keep any of my fruit for our own pleasure. Yes, I often forget to change settings on the camera. I keep thinking I should remember to leave it on automatic but many an otherwise good shot is spoiled by inappropriate settings. Hi Mick...What amazing skies and sea colors just gorgeous scenery!! Of course who doesn't love a lighthouse ( I know here in Maine we love our Lighthouse's that dot the coastline) lovely sandy beaches, wow I feel the need to head to the coast : ))! Your White Cockies look like real characters, but they are beautiful birds !! What stunning views, Mick!! And what a wonderful spot. I hope to get up that way some time but we don't own a 4WD so seeing the point would be difficult. Hi there - this does seem like a great area to explore - we were off in a part of Victoria that has been "under visited" by us this weekend. Camera settings can be a real pain - mine has a one touch setting system, you can dial in the settings, save them and go back to all of them through a single button - its a good feature. Wow beautiful beach and lovely shots! What truly awesome beach vies Mick. 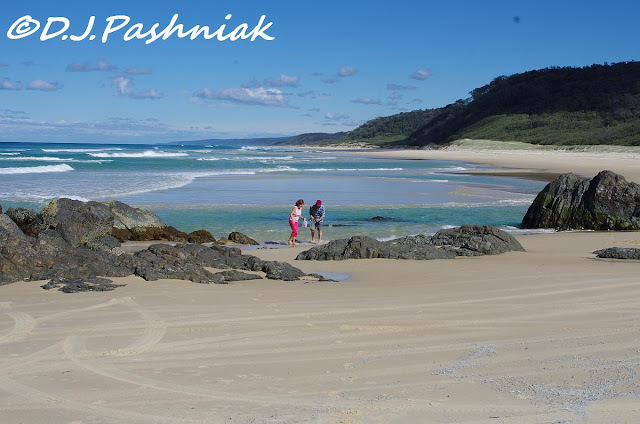 How truly wonderful to go wandering about there, reminds me of the alone times I had alone the foreshore at Hervey Bay. Awesome half-way-up view you've shared. The way the curve of the ocean and the curve of the land meet at the dip is quite remarkable. Glad you made it to the top. Now that's a testament to the worthiness of solar power in keeping a Lighthouse's light working. Also a credit to the builders of the 1880's with the Lighthouse still standing. I noticed in your Post "My Patch" 2 there's a house visible from the air near the house. Does someone still have the privilege of living there now that the Lighthouse is unmanned? To live there would mean enjoying the view just like the person is in your photo. The Coastline of Australia truly is beautiful. Your photos have been a pleasure to experience. Couldn't help but laugh when I read about your morning with the Sulphur Crested Cockatoos, especially when you included the word 'demolished', I used to live with two. Tart Passionfruit followed by sweet Kumquats, how could a a Sulphur resist. Love the story and the photos. Sulphur's happen here in Gympie too, but more often it is the Little Corellas. The Sulphurs come mainly when the big Fig Tree on the property where I rent is in fruit. I remember having a Mulberry Tree, and having to check each morning when were ripe, then getting out early and be quick enough to rescue some for me. Where I am now it's when the Mangoes ripen, it's definitely a bit of a race between me, the Possums and the Fruit Bats at night, then the the various Parrots during the day. Know exactly what you mean about camera settings, sometimes there just isn't time, or I completely forget, and my camera has very little to choose from with being what I call a pretend camera. Thank you for including this link with your 'My Patch" 2. I've had a lovely time. Hi Magda I'm glad you enjoyed this post about the Lighthouse. Lighthouses have a special sort of charm about them I think and especially when they are on a beautiful headland like this. From what I have read the lighthouse keepers house is able to be rented - but under certain conditions. 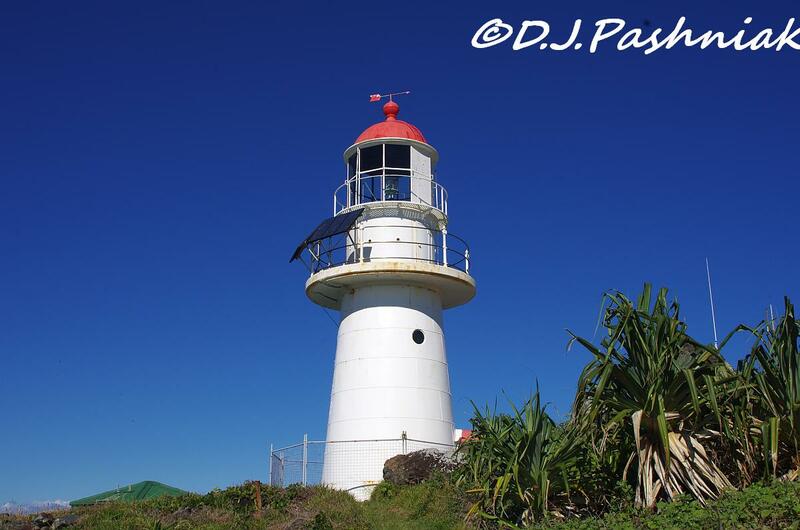 This lighthouse and headland remind me of the one down at Smokey Cape in NSW which is out from Kempsey. 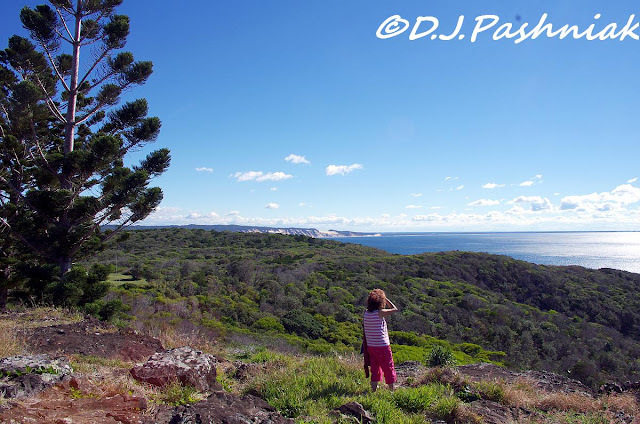 It is a similar high rocky headland with amazing views out to sea and north and south. Many years ago that one used to be open to the public with guided tours - and I went up it once. Amazing to see how well they were built all those years ago. 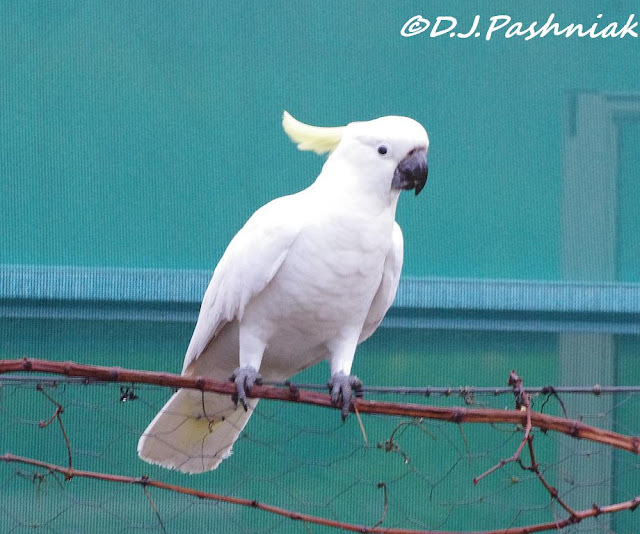 I enjoy watching white cockies - but would much prefer them in someone else's yard!